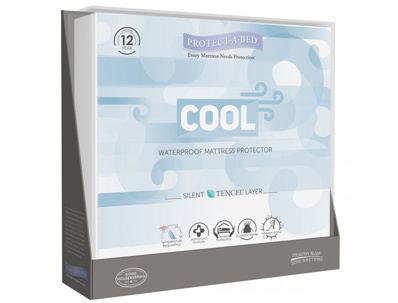 The Protect-A-Bed Therm-A-Sleep Collection Cool Mattress cover offers peace and mind for you and your mattress. Not only does the mattress have a 100% Lycell cool touch fabric, it also has the Protect-A-Bed waterproof membrane on the underside. So any accidents in the bed will not seep through to the mattress, this will also greatly help with bed bugs as they will not get through the waterproof membrane. The Therm-A-Sleep cool cotton mattress cover is further treated with Tencel fabric to help the cover stay cool during sleep time. This mattress cover is washable at 60" degrees and can be tumble dried at a low temperature.